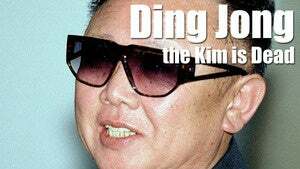 Kim Jong-il, the fearsome, furtive, and fashion-forward leader of North Korea, is dead at age 69. This according to a weeping announcer on a "special broadcast" delivered on North Korean television on Monday. The Dear Leader was on a train traveling through Pyongyang during a "field guidance tour" at the time. Jong-il had already made preparations for a successor: His third son, Kim Jong-un, is set to fill his father's shoes as dictatorial supreme commander and god-figure of the amusingly named Democratic People's Republic of Korea. Not only will the twenty-something heir inherit a massive cult of personality with which to rule with an iron fist over this volatile nuclear-weaponized state, but his father's legendary designer sunglasses collection as well.